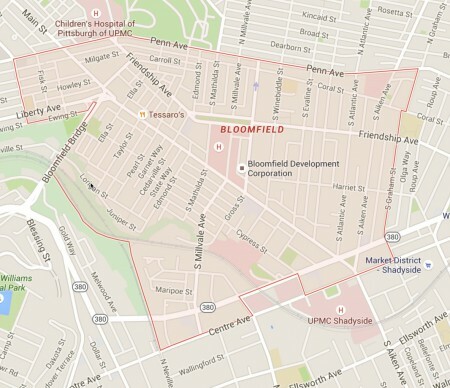 Named for the abundant wildflowers that once grew here, Bloomfield is situated on 449 acres in the heart of Pittsburgh’s East End. The neighborhood is bounded by Shadyside, Lawrenceville, Friendship, and Garfield. Major corridors in Bloomfield are Liberty, Penn, Centre, and Friendship Avenues. Liberty Avenue runs through the center of the community and provides residents with a thriving business district, as well as direct access to downtown Pittsburgh. The Bloomfield Bridge, which was built in 1914, links the community to Oakland, with its medical complex, universities and cultural centers. Bloomfield has one of Pittsburgh’s most active business districts, providing residents and visitors with easy access to a full service grocery store, three small Italian markets, a butcher shop, three bakeries, coffee shops, a major hospital, several doctors offices, pharmacies, banks, hair salons, barbershops, bookstores, gift shops, art galleries, clothing stores, and choice of restaurants serving a variety of cuisines. For more about local businesses, see our Bloomfield Business Directory. Originally home to the native Delaware tribe, Bloomfield was claimed by Casper Taub, a pre-revolutionary war settler. The land was later purchased by Taub’s son-in-law, Joseph Conrad Winebiddle, who passed it on to his four children. Many of the streets in the area take their names from members of Winebiddle’s clan, including Winebiddle, Roup, Aiken, Negley, and Baum. When the City of Pittsburgh annexed the property in 1868, the Winebiddle family divided the land into plots and sold them to German Catholic immigrants. A second wave of immigrants, Italians from five towns in the Abruzzi region, gave the neighborhood its current nickname. Today, several generations later, many of the descendants of these early immigrants remain in Bloomfield, giving the neighborhood its gritty, authentic character. In 2011, BDC completed a vision planning process for the neighborhood. Creating the vision plan took almost a year and involved well over 100 community members in many focus groups and community meetings, and was facilitated by inter*ARCHITECTURE.